Name: Iron derives its name from the Anglo-Saxon 'iren'. The element symbol, Fe, was shortened from the Latin word 'ferrum' meaning 'firmness'. History: Ancient Egyptian iron objects have been dated to around 3500 B.C. These objects also contain approximately 8% nickel showing the iron may have originally been part of a meteorite. The "Iron Age" began around 1500 B.C. when the Hittites of Asia Minor began to smelt iron ore and make iron tools. Number of isotopes: 14 isotopes are known. Naturally occuring iron is made up of four isotopes. Iron is vital to plant and animal life. Iron is the active part of the hemoglobin molecule our bodies use to transport oxygen from the lungs to the rest of the body. Iron metal is widely alloyed with other metals and carbon for a multiple commercial uses. Pig iron is an alloy containing about 3-5% carbon, with varying quantities of Si, S, P, and Mn. Pig iron is brittle, hard, and fairly fusible and is used to produce other iron alloys, including steel. Wrought iron contains only a few tenths of a percent of carbon and is malleable, tough, and less fusible than pig iron. Wrought iron typically has a fibrous structure. Carbon steel is an iron alloy with carbon and small amounts of S, Si, Mn, and P. Alloy steels are carbon steels that contain additives such as chromium, nickel, vanadium, etc. Iron is the least expensive, most abundant, and most used of all metals. Iron is the 4th most abundant element in the Earth's crust. The Earth's core is believed to be comprised primarily of iron. Pure iron is chemically reactive and corrodes rapidly, especially in moist air or at elevated temperatures. There are four allotropes of iron known as 'ferrites'. These are designated α-, β-, γ-, and δ- with transition points at 770, 928, and 1530 °C. The α- and β- ferrites have the same crystal structure, but when the α- form becomes the β- form, the magnetism disappears. 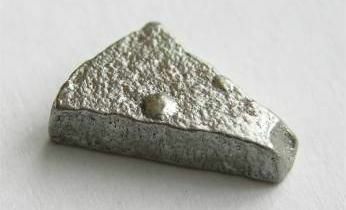 The most common iron ore is hematite (Fe2O3 mostly). Iron is also found in magnetite (Fe3O4) and taconite (a sedimentary rock containing more than 15% iron mixed with quartz). The top three countries that mine iron are Ukraine, Russia and China. China, Australia and Brazil lead the world in iron production. Many meteorites have been found to contain high levels of iron. Iron is found in the sun and other stars. Iron is an essential mineral for health, but too much iron is extremely toxic. Free iron in the blood reacts with peroxides to form free radicals that damage DNA, protein, lipids and other cellular components, leading to illness and sometimes death. 20 milligrams of iron per kilogram of body weight is toxic, while 60 milligrams per kilogram is lethal. Iron is essential for the development of brain development. Children with iron deficiencies show a lower ability to learn. Iron burns with a gold color in a flame test. Iron is used in fireworks to make sparks. The color of the sparks will depend on the temperature of the iron. CRC Handbook of Chemistry & Physics (89th Ed. ), National Institute of Standards and Technology, History of the Origin of the Chemical Elements and Their Discoverers, Norman E. Holden 2001.